Jennifer Montone | The Chamber Music Society of Lincoln Center. 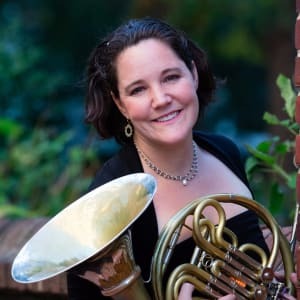 Jennifer Montone joined The Philadelphia Orchestra as principal horn in 2006, and is currently on the faculties of The Curtis Institute of Music and The Juilliard School. She was formerly the principal horn of the Saint Louis Symphony, associate principal horn of the Dallas Symphony, adjunct professor at Southern Methodist University, and performer/faculty at the Aspen Music Festival and School. Named the Paxman Young Horn Player of the Year in London in 1996, she has since won many solo competitions and awards, including an Avery Fisher Career Grant in 2006 and a 2013 Grammy Award for her recording of Penderecki’s Horn Concerto entitled Winterreise. She has performed with the Berlin Philharmonic, Cleveland Orchestra, Orpheus Chamber Orchestra, New York Philharmonic, Metropolitan Opera Orchestra, National Symphony Orchestra, Saint Paul Chamber Orchestra, and New Jersey Symphony Orchestra, in which she was awarded the position of third horn while still a student. She performs regularly at the Chamber Music Society of Lincoln Center, La Jolla SummerFest, Strings Festival, and Santa Fe Chamber Music Festival, and is a coach at the New World Symphony. A native of northern Virginia, Ms. Montone was in the National Symphony Fellowship Program, where she studied with Edwin Thayer, was a fellow of the Tanglewood Music Center, and attended the Marlboro Music Festival. She is a graduate of The Juilliard School as a student of Julie Landsman.